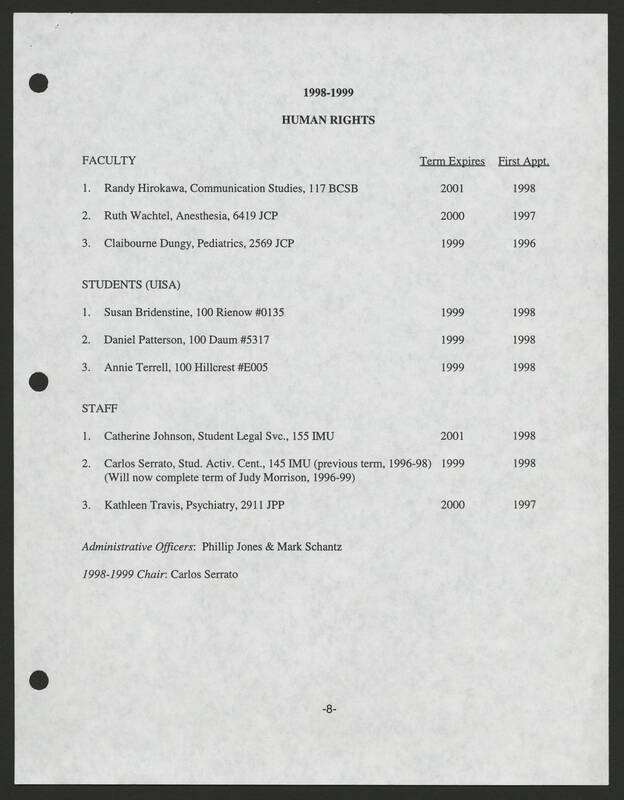 1998-1999 HUMAN RIGHTS FACULTY Term Expires, First Appt. 1. Randy Hirokawa, Communication Studies, 117 BCSB 2001, 1998 2. Ruth Wachtel, Anesthesia, 6419 JCP 2000 1997 3. Claibourne Dungy, Pediatrics 2569 JCP 1999 1996 STUDENTS (UISA) 1. Susan Bridenstine, 100 Rienow #0135 1999 1998 2. Daniel Patterson, 100 Daum #5317 1999 1998 3. Annie Terrell, 100 Hillcrest #E005 1999 1998 STAFF 1. Catherine Johnson, Student Legal Svc., 155 IMU 2001 1998 2. Carlos Serratom Stud Activ. Cent., 145 IMU (previous term, 1996-98) 1999 1998 (Will now complete term of Judy Morrison, 1996-99) 3. Kathleen Travis, Psychiatry, 2911 JPP 2000 1997 Administrative Officers: Philip Jones & Mark Schantz 1998-1999 Chair : Carlos Serrato.